For the Best Man & Maid of Honor, I will be posting more great toasts to give you some ideas. I have tapes full of great wedding reception toasts. So keep checking back for my new toast posts soon! * Don’t over-think your wedding speech. It is actually easier than other forms of public speaking, as people will expect you to be nervous. * If you don’t feel confident memorizing your speech, use small cards as prompts. Cards are better than paper because it is less obvious if your hands are shaking! * Look up around the company and try to involve the whole room through your body language. * Be brief rather than long-winded. Even the most interesting of speeches can sometimes seem to drag on and on. The last thing that you’ll want to do is bore your wedding guests to death! * Try to keep the content of your speech neutral and upbeat, (i.e. avoid being lewd). This is particularly important if there are older, or very much younger, guests at your wedding. Through the miracle of video your toast may be viewed by the bride and grooms grandkids one day! * Use an icebreaker as your first line to take the ‘pressure’ off yourself and guarantee a laugh. * And remember… don’t panic if the worst happens and you forget your words. Just speak from the heart. After all, you know how happy you feel! 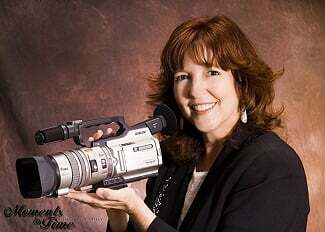 ~ by Leslie Harris Senac of Visions Unlimited Video Productions of Sarasota, Florida with excerpts by By Joanne Elliott.